Rooks, MG, et al. Harvard School of Public Health, Boston, Massachusetts, USA. Humans benefit from gut bacteria, but they may be harmful. Human gut bacteria help digest food, produce many chemicals for nutrition, and alter the immune system. Abnormalities of the pattern of microbes in the gut are influenced by our diets and appear to be associated with specific diseases, including cancer. Some bacteria play roles in cancer progress, either protective or in promoting cancer. Other bacteria are associated with obesity, inflammatory bowel disease, and diabetes. Cancer rates increase significantly following chronic bacteria-caused inflammation, which damages human DNA. 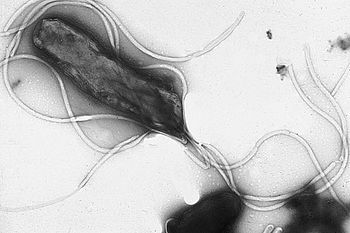 Bacteroides fragilis in the intestine is thought to initiate colon cancer in humans. Bacteria must be able to survive in the constantly changing environment of the gut. The “Western diet” with high fats and sugars increases the risk of certain cancers due to the types of bacteria it promotes. The shift to a plant-based diet causes a shift in gut bacteria types, reducing the risk of cancer. Undigested food is the major food source in the lower gut. Bacteria break down fibers and produce short-chain fatty acids, such as acetic, propionic and butyric acids, providing 10% of our daily energy supply. Most of the short-chain fatty acids are absorbed into the body for various functions. Acetate may help control inflammation and protects the person from pathologic bacteria (such as E. coli). Butyric acid has some anti-cancer effects. Plant polyphenols provide us with protection from cancer. Some of the Bacteroides bacteria have been shown to metabolize polyphenols, increasing the bioavailability of these chemicals. Polyphenols can even be produced by gut microbes. Ellagic acid, found in nuts and berries, is metabolized to urolithins by gut bacteria, urolithins reduce inflammation and protecting one from cancer. Isoflavones are one type of polyphenol. Soy isoflavones have hormone activity, and may be protective against prostate cancer. Better designed studies of soy isoflavones are needed. The black edges of well-done beef are believed to be carcinogenic, because the chemicals cannot be fermented by gut bacteria. Instead, they can damage intestinal DNA and increase the risk of colon cancer. Hydrogen sulfide from high protein foods, especially meat, can damage DNA as well; patients with colon cancer and inflammatory bowel disease often have high levels of sulfur-producing bacteria. CONCLUSION: The human microbiome (gut bacterial composition) consists of a bacterial community which may be beneficial or detrimental. In the future there is a potential for developing useful cancer prevention and treatment techniques.